Outsider was formed in 1989 in Qutaisi by Robi Kukhianidze. Robi doesn't considers himself as punk or alternative musician (so called alternativshik), though his band Outsider has both punk and alternative elements in it. He dislike when someone calls him father of Kutaisian rock or father of Georgian alternative music, moreover he don't likes such conditional titles. He considers Peter Mamonov, well-known Russian underground musician, as one of his biggest teacher. The Outsider recorded its first album "Inside" in Mamonov's studio, Moscow in 1992. By the way this album was the first Georgian vinyl among Georgian rock-band albums which was recorded abroad. Outsider was the only Georgian band which took part in 1991 first in Talin and then in Moscow international alternative music festivals. 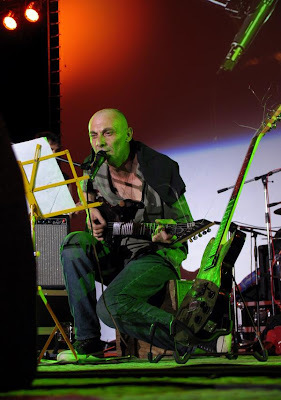 Front man, vocals and Guitar player of Trio Outsider, Robi Kukhianidze moved from Kutaisi to The capital in the year 2000. Despite this, his music was well known in Tbilisi from 1996 when he won a prize on festival "Margarita 96" as a best Georgian alternative musician.